Includes one (1) pair of black fingerless gloves with skeleton bone print. One size fits most. 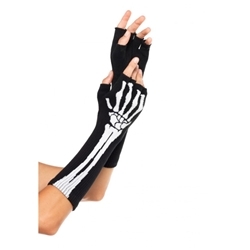 These gloves can be paired up with a skeleton costume, zombie costume, or other undead costume to add to the look. It can also be worn has a "gothic" style glove for everyday wear.